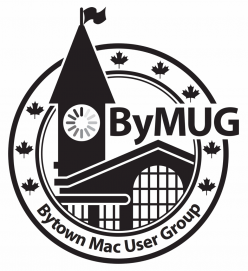 What is the Bytown Mac User Group (ByMUG)? The Bytown Mac User Group (ByMUG) is a free membership social Mac-based computer user group located in the heart of Canada’s capital: Ottawa, within its Byward Market. ByMUG caters to anyone using a Mac who happens to be in the Ottawa-area on the day of its monthly meeting. Each ByMUG meeting take place on the first Sunday of every month at Patty Bolands, a local eatery/pub. They have excellent pub fare, as well as friendly employees that make your Patty Bolands visit a homey experience. Each meeting offers a variety of topics, including demonstrations, question periods, guest speakers, announcements, and more. Check out the Meeting section for upcoming meeting announcements, as wlel as past meeting notes. The idea of an Ottawa-based social user group serving the local Mac community came to us one day. The idea sounded wonderful in passing, and after asking around to see who else liked the idea, ByMUG became a reality. Bytown is the original name for the city of Ottawa when it was founded in 1827. It was incorporated in 1850, and, upon incorporation into a city in 1855, was given its current name, Ottawa. The Bytown Mac User Group (ByMUG) meets on every first Sunday of the month (unless otherwise noted) at Patty Bolands Irish Carvery & Pub in Ottawa’s Byward Market. Feel free to look at our Meeting Notes to get a feel of what we cover. Meetings begin at 1 p.m. and last through the afternoon. Although they have been occasionally known to last beyond that. How do I get to a ByMUG meeting? Take any bus, or walk to the Rideau Centre. If you get off the bus on Mackenzie King Bridge, cut through the Rideau Centre and get to Rideau Street. Cross the street and go right up to William Street (that small alley in front of Sugar Mountain) and keep going down William Street until you get to Clarence Street. Cross Clarence Street and go left. It’ll be about fifty feet (50′) down at Share Plates ’N Drinks, located at 47 Clarence Street.